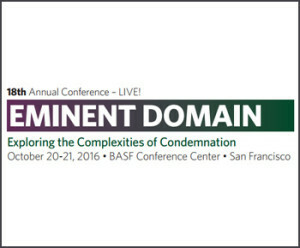 Mark your calendar now for CLE International’s 18th Annual Northern California Eminent Domain Conference. You won’t want to miss a minute! This program is specifically designed for appraisers, planners, right of way professionals, attorneys, engineers, property owners, government officials, and anyone else involved in or affected by condemnation law in California. High Speed Rail … and more! Download the Event Brochure To View Full Schedule Information for the 18th Annual Northern California Eminent Domain Conference.